In recent years scientists have been trying both to increase the efficiency of solar cells, whilst at the same time reducing dimensions and costs. Increases in efficiency have been brought about by implanting carbon nanotubes onto the surface of solar cells in order to reduce the reflection of sunrays, as well as through the insertion of polymeric arrays into the intrinsic layer for charge separation. 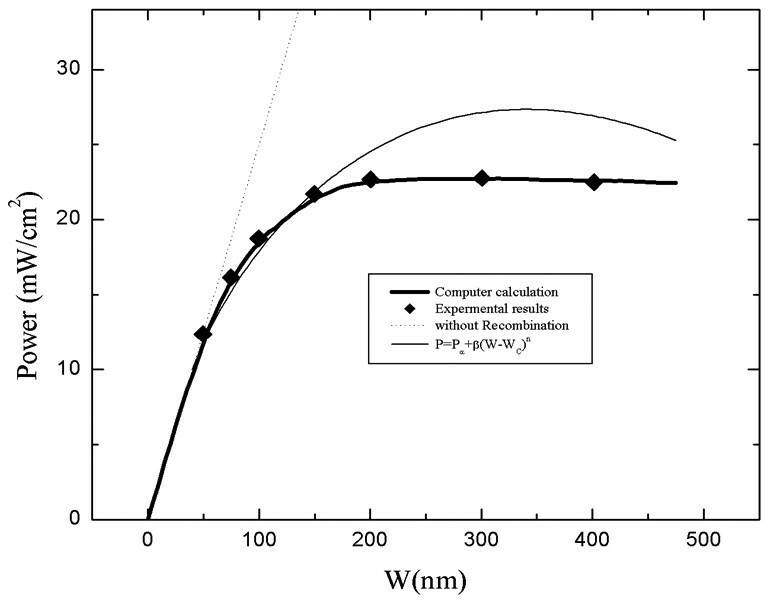 The experimental results show power rising linearly for intrinsic layer thicknesses between 0–50 nm. Wider thicknesses increase the possibility of recombination of electrons and holes, leading to perturbation of the linear behaviour of output power. This effect is studied and formulated as a function of thickness. Recognition of the critical intrinsic layer thickness can permit one to determine the length of carbon nanotube necessary for optimizing solar cells. In this study the behaviour of output power as a function of intrinsic layer thicknesses has been described physically and also simulated. In addition, the implantation of carbon nanotubes into the intrinsic layer and the necessary nanotube length required to optimize solar cells have been suggested. Developing inexpensive and renewable energy sources is one of the most important scientific and technological challenges of our time. Solar energy is an inexhaustible energy source that can be harnessed to meet our growing future energy needs. However, traditional photovoltaic (solar-to-electric conversion) technology is too expensive to be the suitable alternative for fossil fuels or even other competing renewable energy sources. A significant leap in the scientific and technological progress of renewable energy sources will be required to displace proven, but unsustainable energy production methods. Nanotechnology is driving new interesting developments in photovoltaic technology. Advances in organic synthesis and characterization techniques allow us to coax a photocurrent from organic, 'soft' molecules in a process that mimics photosynthesis in plants, thus potentially opening up the way to cheap, ubiquitous solar cells. Power production resulting in zero greenhouse gas emissions is economically and environmentally desirable. Direct photovoltaic conversion of sunlight into electricity is therefore the highly attractive alternative to unsustainable energy sources such as fossil fuels. Although silicon solar cells have gained a considerable market share and commercial success, high production and up-front installation costs still limit their commercial viability. In this study, we explore the use of low-cost advanced materials for photovoltaic energy production and the mechanism of photovoltaic action in a new class of solar cell, that is, the heterojunction photovoltaic. These are constructed from a thin film of cheap composite material, a mixture of carbon nanotubes and conductive polymer . We now aim to address the issues that determine the thickness of the absorber (or "intrinsic") layer. Figure 1 illustrates a computational calculation that shows how the output power of an a-Si-based pin cell varies with intrinsic layer thickness. The curves differ in the specified absorption coefficients for a monochromatic illumination using varying photon energies. All curves were calculated for the same photon flux. Such illumination conditions might be achieved by experiment using a laser whose photon energy can be tuned from 1.8 to 2.3 eV, however the presence of sunlight, of course, presents a much more complex situation. Computer calculation of the power output from a pin solar cell as a function of intrinsic layer thickness. The differing curves indicate results for monochromatic illumination with absorption coefficients from 5000/cm to 100 000/cm; for typical a-Si: H, this range corresponds to a photon energy range from 1.8 to 2.5 eV. Solid symbols indicate illumination through the p-layer and open symbols indicate illumination through the n-layer. Incident photon flux = 2 × 1017/cm2s; no back reflector. The data are obtained from real experiments, with the curves calculated using methods outlined in the references [3-8]. We will first discuss the results for illumination through the p-layer (solid symbols in the figure). For intrinsic layers that are sufficiently thin, the power is proportional to the number of photons absorbed (i.e. to the product of the thickness, d and the absorption coefficient, η). Within this limit the fill factors have nearly ideal values around 0.8. As the thickness of the cell increases, the power saturates. 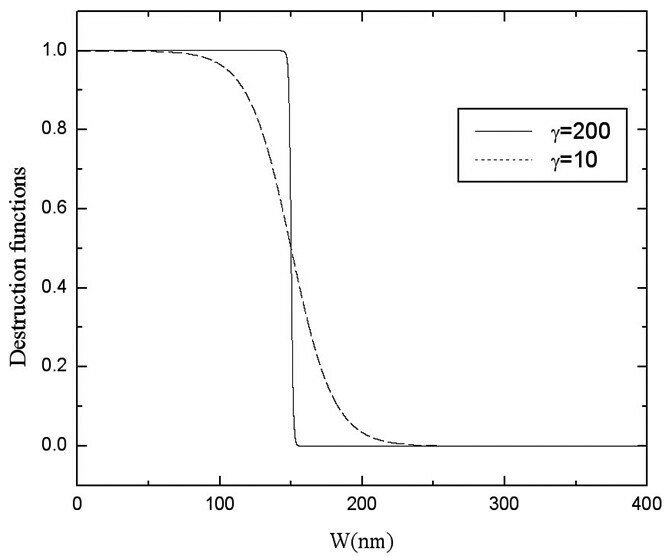 In figure 1 the first plot (η = 100 000/cm – corresponding photon energy of about 2.3 eV) shows the behaviour for strongly absorbed illumination. 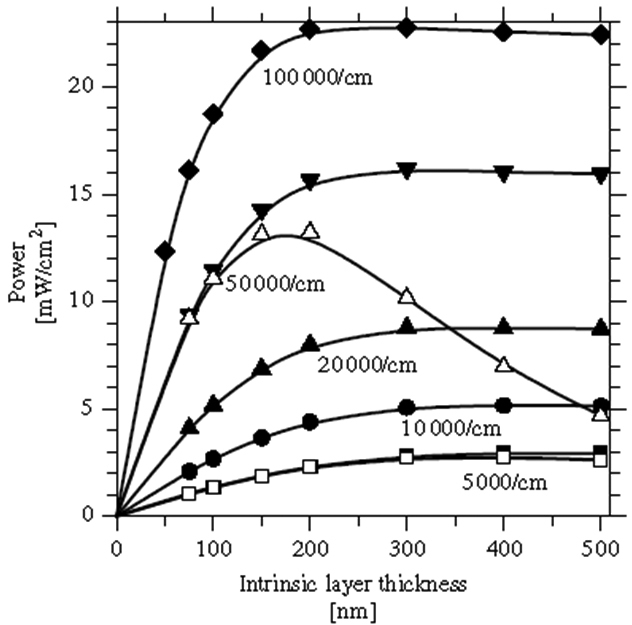 Power saturation occurs for thicknesses greater than 100 nm, that is, typical distance at which photons are absorbed. Since thicker cells do not absorb much additional light, going beyond this length means power stops increasing . Different models have been proposed to simulate the experimental results [3–8]. Figure 1 shows the behaviour of power as a function of intrinsic layer thickness. Several experiments have been carried out to demonstrate the effect of layer thickness on output power. where, α is a coefficient and can be calculated for each curve, w is the intrinsic layer thickness, with Pα termed the ideal power (linear form). Because the recombination phenomena begin at a certain intrinsic layer thickness then it is useful to plot Pα-Pexp as a function of the intrinsic layer thickness. Figure 2 shows the difference between the experimental power and Pα as a function of the intrinsic layer for P1 type with α = 0.24 and η = 100 000/cm (absorption coefficients). The difference between ideal (linear form) and experimental power as a function of the intrinsic layer thickness for P1 type. where β is the recombination coefficient. This equation is plotted in figure 3 with β = 0.02 and n = 1.41. Ideal, theoretical and experimental power as a function of the intrinsic layer thickness for P1 type. Figure 3 shows the ideal (linear form), theoretical and experimental powers as a function of the intrinsic layer thickness for P1 type. 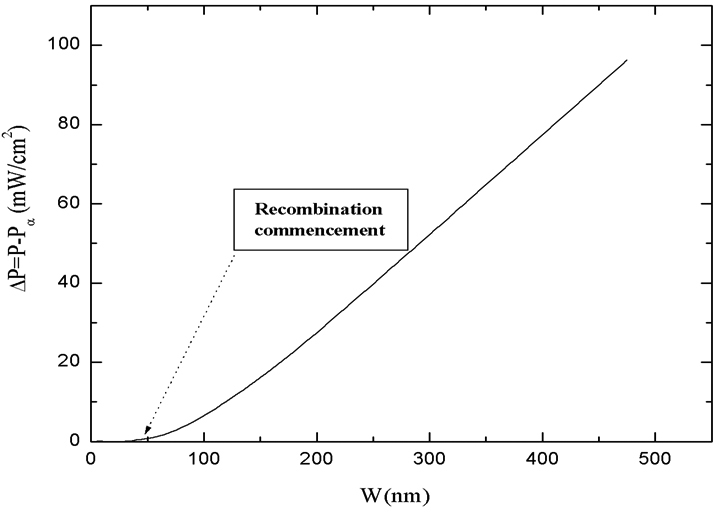 The recombination phenomena start at Wc = 40 nm, which we call the critical intrinsic layer. 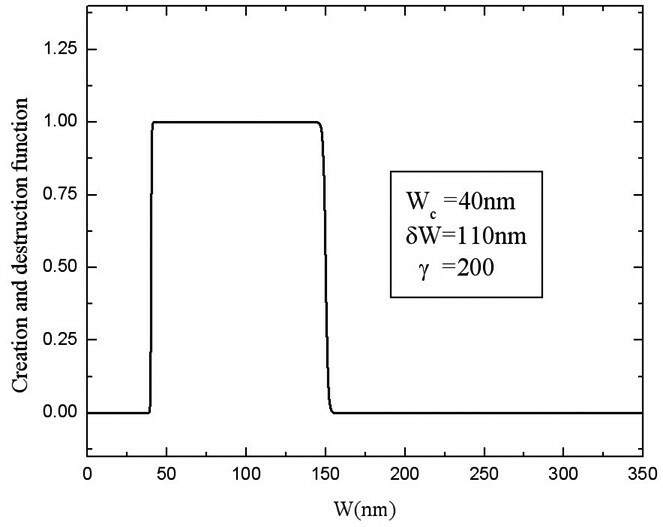 From figure 3 it can be seen that the theoretical power values between 0–150 nm almost match the experimental results. However after 150 nm the agreement between the fits is poor. When the difference between the intrinsic layer thickness and carrier current cross section is small, the two-dimensional recombination phenomena are expected to dominate (from 40 nm up to 150 nm for P1 type). Whereas, when the difference between the intrinsic layer thickness and carrier current cross section is large (after 150 nm for P1 type) the three-dimensional recombination phenomena dominate. On increasing the length of intrinsic layer, the three-dimensional recombination becomes dominant and exhibits linear behaviour. where a and α' are the three dimensional recombination coefficients. where X (w) is the creation and destruction function and Y (w) is the creation function. where γ is function sharpness parameter. Figure 4 shows the plot of the destruction function against different sharpness parameters. Destruction functions as a function of different sharpness parameters. The behaviour of equation 7 is shown in figure 5. We can calculate the data for the theoretical power plot by using the functions X (w), Y (w) and equation. 4. The data plotted for the calculation of theoretical power with a function sharpness parameter equal to 5 are shown in table 1. It is important to note that the recombination starts at wc. A plot using the data outlined in table 1 is shown in figure 6. Data plotted for the calculation of theoretical power (γ = 5). Creation and destruction function at different sharpness parameters. Simulated plot of power as a function of intrinsic layer thickness. Because of the symmetry and unique electronic structure of graphene, the nanotube's structure strongly affects its electrical properties. For a given (n, m) nanotube, if n – m is a multiple of 3, then the nanotube is metallic; such is the case for all armchair (n = m) nanotubes. In terms of metallic behaviour, carbon nanotubes can have conductivity up to eight times that of copper, and can carry a current density comparable to that of any known conventional metallic wire; this makes carbon nanotubes potential candidates as nanoscale wires . It is consequently possible to reduce the recombination phenomena by using the carbon nanotubes in the intrinsic layer. The presence of an aligned doped carbon nanotube (armchair, superconducting) in the intrinsic layer helps maintain linear power generation behaviour, in addition to making solar cells with higher output powers. It is important to note that the volume occupied by carbon nanotubes in the intrinsic layer affects only the linearity coefficient. When considering the behaviour of power as a function of intrinsic layer thickness, the recombination of electrons and holes plays an important role in reducing the power. Eliminating recombination is useful in maintaining the linear behaviour of power and in producing solar cells with high powers. If the intrinsic layer thickness is comparable to the carrier current cross section, the two dimensional recombination phenomena are dominant; otherwise the three dimensional recombination phenomena would dominate. 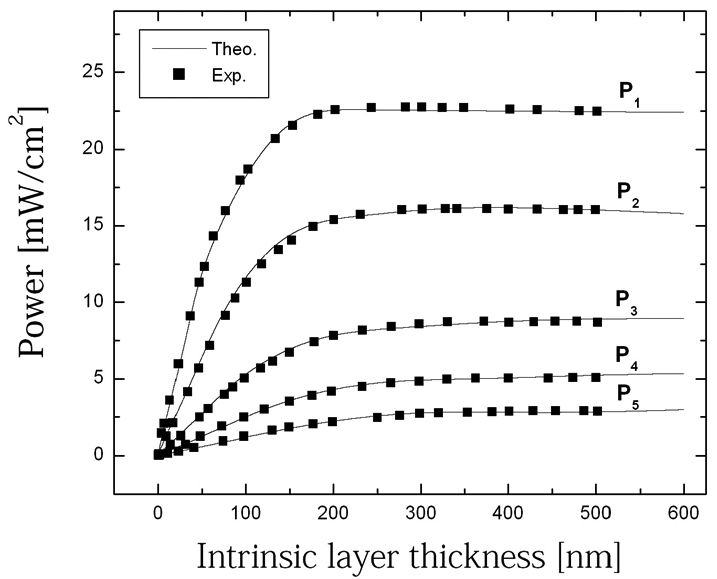 In this study, power as a function of the intrinsic layer thickness was simulated and plotted, thus allowing us to express the necessary length of carbon nanotubes required for optimized solar cells as a function of the intrinsic layer thickness.